The We Are Water Foundation, through its main sponsor Roca, collaborates on the Indian government’s project Swachh Bharat Abhiyan, supplying 40,000 sanitation plaques. The Vicente Ferrer Foundation will install the new latrines in Anantapur and will undertake an educational campaign to ensure the appropriate awareness of the users. The goal of the Swachh Bharat is one of the most ambitious in the world of sanitation: by 2019 to end open defaecation in India, a country with more than 1.2 billion inhabitants of which, in 2014, some 600 million regularly did this unhealthy and undignified act. The magnitude of the project was made quite clear in the round table discussion “Sanitation for all. Ghandi’s dream and the challenge for India”, organised by the We Are Water Foundation on the 19 November last year in the Roca Barcelona Gallery for World Toilet Day (see news). 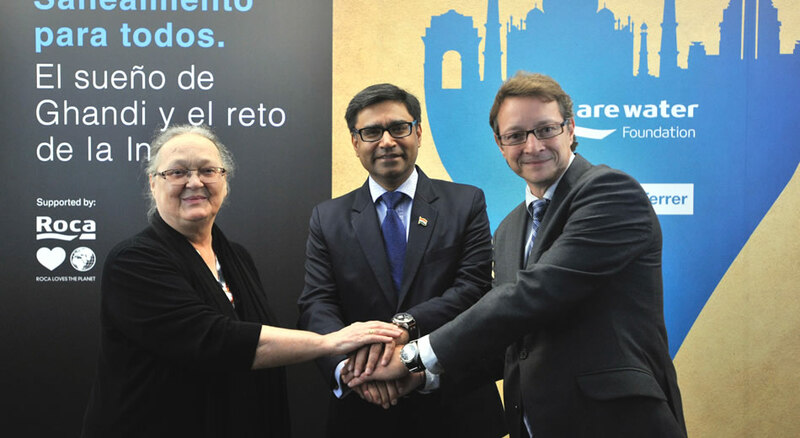 At the round table discussion, the ambassador for India in Spain, Mr.Vikram Misri, emphasised the importance of collaboration between companies in the programme, the work of which had already begun: between April 2014 and January 2015, 3.1 million toilets had been built in the country of the 120 million planned, a project costing 10 billion dollars, promoted by the new Indian prime minister, Narendra Modi. Also in the debate, María Vallés, Director of Corporate Development in the Vicente Ferrer Foundation, pointed out the social scale of the challenge of providing dignified sanitation in the regions of Anantapur and Kurnool, in the state of Andhra Pradesh, where the Vicente Ferrer Foundation takes part in the Swachh Bharat initiative. Vallés highlighted the importance of quality of the toilets and education to ensure that the installations are sustainable and thus long-lasting in the homes of the most disadvantaged families. With this proposal, the Vicente Ferrer Foundation plans to build 100,000 latrines, 40,000 of which will be supplied by Roca, sponsor and promoter of the We Are Water Foundation. In the context of World Toilet Day, both foundations signed a collaboration agreement with this aim of great importance for the Swachh Bharat programme. 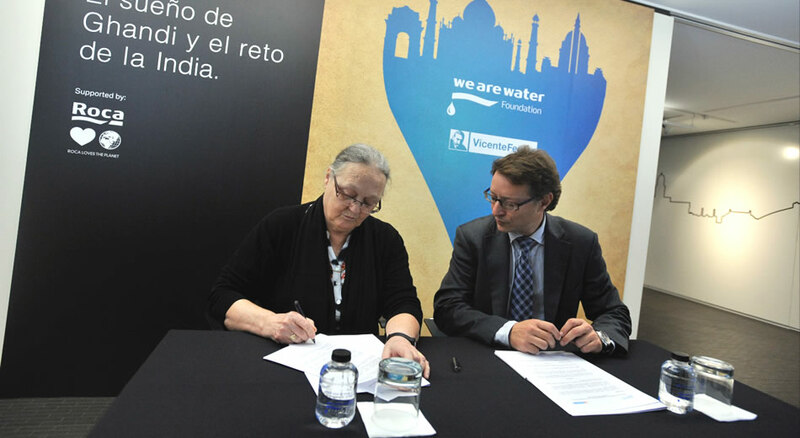 Attending the signing event, as well as the ambassador Vikram Misri, were the President of the Vicente Ferrer Foundation, Anna Ferrer, the Managing Director of the entity, Jordi Folgado and Xavier Torras, Director of the We Are Water Foundation. The Indian ambassador, Mr. Vikram Misri, pointed out that this contribution will be “fundamental for the health and wellbeing of the coming generations”. Anna Ferrer stated her satisfaction with the collaboration of the Vicente Ferrer Foundation with the Central Government of India, with Roca and with the We Are Water Foundation: “It is the first time that many thousands of families in Anantapur, where we are working, will have a bathroom with toilet”. The widow of Vicente Ferrer highlighted the fundamental aspects for ensuring the success of the programme: “Raising awareness, education and good quality construction of the installations is very important”. In this sense, the Vicente Ferrer Foundation will undertake an awareness-raising campaign so that the beneficiary families use the installations properly and ensure their maintenance. The families receive a subsidy for their home of 15,000 rupees (215 euros), which is issued in two stages; the first when the ditches are made and another when the latrine is ready for use. This agreement is also located in the context of collaboration between the Vicente Ferrer Foundation and the We Are Water Foundation and which since 2010 has resulted in the development of several projects, such as the construction of a reservoir in Ganjikunta, the excavation of wells in Andhra Pradesh, the development of horticulture through drip irrigation systems, or the construction of hydric structures for the collection and use of water, all of them in India. The We Are Water Foundation, promoted by the Roca company, has as objectives, on the one hand, to raise awareness amongst the general public and the administrations about the need to promote a new culture of water and, on the other hand, relieve the negative effects related to the lack of hydric resources, through the development of cooperation and aid programmes alongside diverse organisations such as Education without Frontiers, the Vicente Ferrer Foundation, Intermón Oxfam and UNICEF.